Looking for a fun way to spend your Wednesday* mornings? 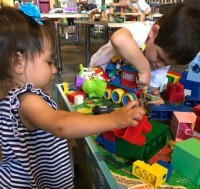 Tots & Trains is scheduled, every first and third Wednesday of the month through May, 2019. In June, July, and August, Tots & Trains will be held each Wednesday! Join us at the Jackson Street Roundhouse & Museum for Tots & Trains! Join us on the 1st and 3rd Wednesdays of the month, now through May, 2019. Looking for a fun way to spend your Wednesday* mornings? Join us at Jackson Street Roundhouse & Museum for Tots & Trains! This program is held every 1st and 3rd Wednesday of the month, from 10am - 12pm. Enjoy a morning of family fun! Play in our open play area with train tables and interactives. Create a craft to take home and listen to a transportation-themed story read by our wonderful volunteers. Adults can enjoy coffee and treats as well! Tickets can be purchased at the door or online! *For the winter/spring season, Tots & Trains is scheduled every first and third Wednesday of the month through May, 2019, then every Wednesday until Labor Day.